Wizard School is a true wonder to behold, chock-full of enticing projects to create, fascinating videos to explore, and a safe way to share. 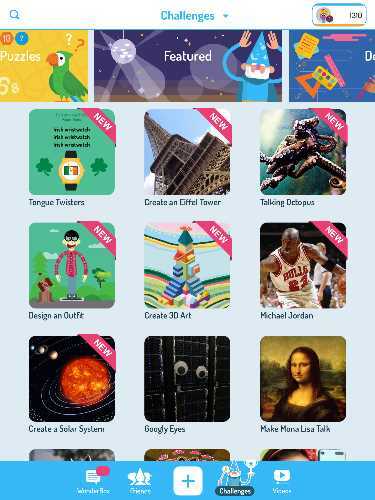 Wizard School (formerly known as WonderBox) is an app full of opportunities that allow kids to experience wonder. Players enter a safe playground where kids create new things in the process of learning about a wide variety of topics. Within this learning environment, kids can share and collaborate with others they know. The app has two main paths for exploration: Challenges – which entice kids to create something new -- and Videos – sorted by topics and interests. This box of wonder puts all of its interesting content into categories, so that kids can scroll through enticing photos to find a topic that resonates with them. Players can also navigate to content by using the app’s Search tool. When kids enter Wizard School, they are greeted with a tiled interface of over 120 teacher-created Challenges and more than 3,000 fascinating short videos to explore. Since there is so much content, the app cleverly provides categories along the top of the screen for kids to scroll through by swiping. They can navigate to science, people, the world, drawing, music, sports, do-it-yourself, photography, and many more topics. From within a category, kids then look down the rows of titled photos to find one that interests them. New content is added every week. Since so much of this app relies on video, players need to be online to be able to use it. The app has a coin system where the player receives 1,000 coins for joining, and then earns more by doing Challenges, watching videos, and sharing with others. Kids spend coins to unlock additional options within Challenges or to jazz up their avatar. The Challenges vary greatly, depending on the subject matter. One challenge introduces the artist E.C. 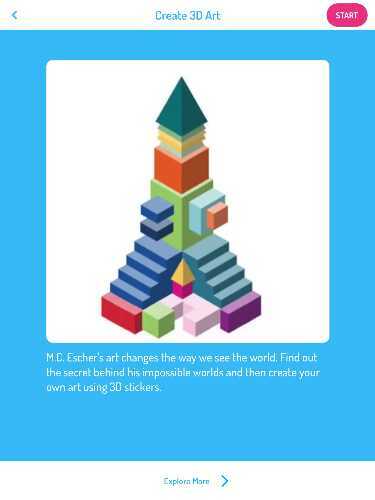 Escher by showing some of his famous paintings and then asks kids to create their own 3D artwork using WonderBox’s 3D block tools. In another Challenge, the app provides kids with an opportunity to create their own commercial. This Challenge introduces the parts of a commercial via an instructional video and then provides kids with many examples to watch. Next, kids use the device’s camera to create their own commercial. Beloved Harry Potter author J.K. Rowling is the subject of another fun Challenge. After learning about the author, kids are invited to make her talk. The app provides the digital tools to animate a photo of author J.K. Rowling so that she appears to be saying words that the child has just recorded. It’s a hoot! Other Challenges have kids designing floor plans, conducting experiments, inventing things, creating a superhero, and much more. The over 3,000 videos have been curated from YouTube, Vimeo, and Google Maps. Wizard School provides a safe viewing experience for kids since all of the included videos have been screened for content. For participants under the age of 13, Wizard School creates a safe environment for kids to collaborate and share by tying the child’s registration to a parent’s consent and email. Before a child can explore this app, the parent must send developer Duck Duck Moose a video showing the adult speaking his or her name. This registration method allows Duck Duck Moose to verify that an adult has agreed to the child’s participation. 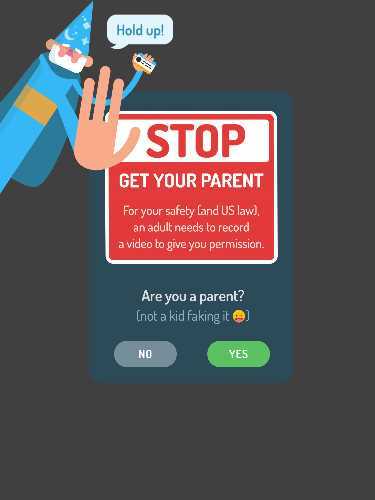 The parent then controls the kids’ accounts, including being able to see (and delete) any content created and/or shared by the child. The parent also controls which adults (such as Grandma) can be sent content by the industrious child. Duck Duck Moose has also created a way for kids to share safely with their friends. Participants who want to share and collaborate with other kids can do so by first exchanging codes. With each child having to provide the other with a code in real life, the app assures that players actually know each other. Parents have the ability to review this adding of known friends. Wizard School is a ground-breaking app because it brings together three things kids love to do: create new things, learn about the world from watching fascinating videos, and share what they experienced with friends and family. Its brilliantly offers irresistible DIY projects supported by curated videos that teach kids the skills necessary to be inventive. Wizard School will pique your child’s interest in the world and rev up their creative juices. 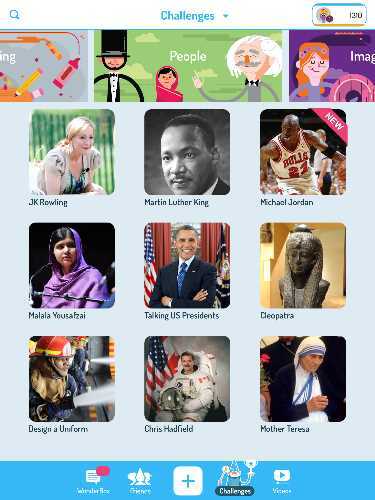 This app intrigues kids and families with both the depth of the information and the range of the topics presented. From seeing the largest Lego structure to creating your own unique snowflake, there is lots here to spark curiosity. And while it is powerful to learn about snow by designing your own snowflake, that learning multiplies when you and your friend can compare the digital snowflakes you each made using Wizard School's intuitive art tools. In addition to creating videos, taking photos, making art, and inventing things using digital tools, many of Wizard School Challenges ask kids to do things away from the device. You may find your child making color explosions by dropping food coloring into a plate of milk and detergent! Wizard School is best for ALL children ages 7-up. Because it entices kids to learn about the world by providing them the means and knowledge to create something new and then share what they make, it creates a powerful and personal learning environment. Since Wizard School is free, this is a no-brainer. Download it now! 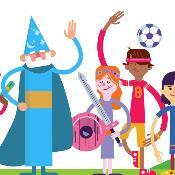 This Wizard School app review was written by Jinny Gudmundsen.